Learn how to get over 500 new Facebook fans every month and turn your fans into lifelong customers using these proven strategies for Facebook marketing and monetization. Step-by-step tutorials for beginners including screenshots and video tutorials show you how to set up your Facebook Fan Page the right way. Discover powerful free content marketing strategies to grow your fan base and connect with your customers. If you're using Facebook for your business but you aren't using it to build your email list, you're missing out on a huge opportunity. This book shows you how to build sophisticated lead capture pages for free. Learn how to set up a profitable Facebook ads campaign to grow your business and increase sales while building your Facebook audience. You'll learn my personal secrets for finding great content for Facebook that your fans will like, share and comment on. Facebook Insights is a goldmine if you know how to use it to get laser-targeted data on your audience in real-time. Screenshot tutorials and tips for using Facebook's newest marketing program to skyrocket your sales. Facebook promoted posts can either drain your cash fast or rack up new sales. Find out how and when to use them the right way. This book will help you dramatically increase your profits online and will turn Facebook time into a fun way to earn more money and grow your business. I have over 26,000 fans on my personal fan page and have several businesses with over 10,000 fans as well. More importantly, my fan pages actually generate new customers and profits. This book isn't written by some academic or sketchy marketer who's just trying to hop on the latest fad. It's written by a successful online marketer, author and social media consultant who's been active on Facebook since 2006. If you're looking for a rock solid social media marketing strategy for Facebook, you will love this book. The truth is there are no Facebook marketing secrets - but there are new strategies, ideas and resources that you've probably never heard of (because Facebook is changing every single month). This book only has the latest, most up-to-date information about Facebook including the new Facebook Offers for select fan pages. Facebook For Business Owners is the ultimate Facebook marketing guide for small business owners. Tom Corson-Knowles is a social media marketing consultant, blogger and entrepreneur. He is the international bestselling author of Facebook For Business Owners, How To Make Money With Twitter, and The Kindle Publishing Bible, among others. Tom's own fan page has more than 33,227 fans with incredible engagement. But it's not just about the numbers. It's about the relationship you have with your fans. Great relationships will lead to long-term business success. 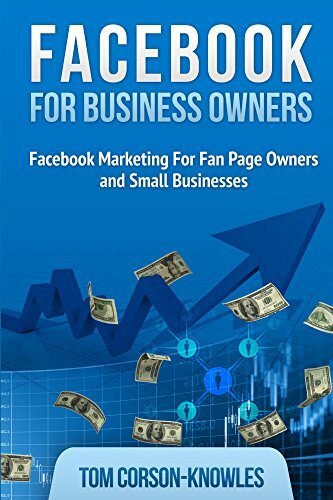 In this book, Tom shares his proven strategies for attracting thousands of new fans to your fan page and turning your fans into very happy customers. Learn how to start getting more fans and business from your Facebook marketing efforts. I used to think LinkedIn was a colossal waste of time - until I discovered the simple secrets to success on LinkedIn. Perhaps you’ve heard that Facebook marketing can help you get customers… but you can't believe all of the hype and noise? Or you’ve considered using Facebook advertising for your business but think you need a PhD in rocket science to figure it all out? This guide blends 5 years of my experience coaching over 4000 students with 6 Facebook marketing courses, helping dozens of businesses, and developing 4 software platforms for marketing on Facebook. Do you want more followers? Would you like the best and most efficient strategies taken from the best influencers? Do you want to monetize your social media? Do you want to improve your habits and your bottom line? Supreme Leadership Habitsbrings together the winning practices of more than 70 CEOs who are celebrating their 25th anniversary in 2019 – that's almost 2,000 years of wisdom!! Warning: reading this book and following the advice within can cause a significant improvement in your habits, and as a result, in your bottom line! Discover how to attract “ideal” customers, dominate your market, and set your business on fire! What if you could put a hundred dollars into Facebook advertising and receive back $200 or more in sales?